Hi Everybody and welcome to another little serving of Philosophy in the Kitchen. Imagine the look on a child's face when he rides a two-wheeler bicycle for the first time without training wheels and that jubilant expression that says, "I can do it!". A child, excited to learn to ride a bike doesn't tell himself, he can't do it, he waits until his legs are long enough and tells himself that one day he WILL be able to ride that bike. And when the training wheels are taken off and he rides it all on his own, he is not surprised because he knew all along that that day would come. Now let's take this analogy into the kitchen. There have been many things over the years that I've told myself I couldn't cook, things I had previously deemed 'too difficult' or somehow out of my realm of experience. And the only reason I 'couldn't' do something is because I told myself I couldn't. I'm here to tell you that our abilities as good cooks or 'bad' cooks is a state of mind. Think about the show, Worst Cooks In America, they have little hope of improving or straying far from the label 'worst cook' when they are constantly being reminded of how bad they are. When an athlete prepares to make a high jump, run the mile or whatever he does, he doesn't say, "I can't do this. ", he psyches himself out, "I'm on the varsity team. ", "I'm a future Olympian. ", "I'm a record breaker." He says what he wants the results to be. But if the world calls you the 'worst cook' and you are on a tv show called 'worst cooks', guess what? It's true....you are one of the worst cooks and as long as you proudly wear the label, you will remain as bad as you say you are. When you fail because you say you're no good, you've actually succeeded. Think about that. 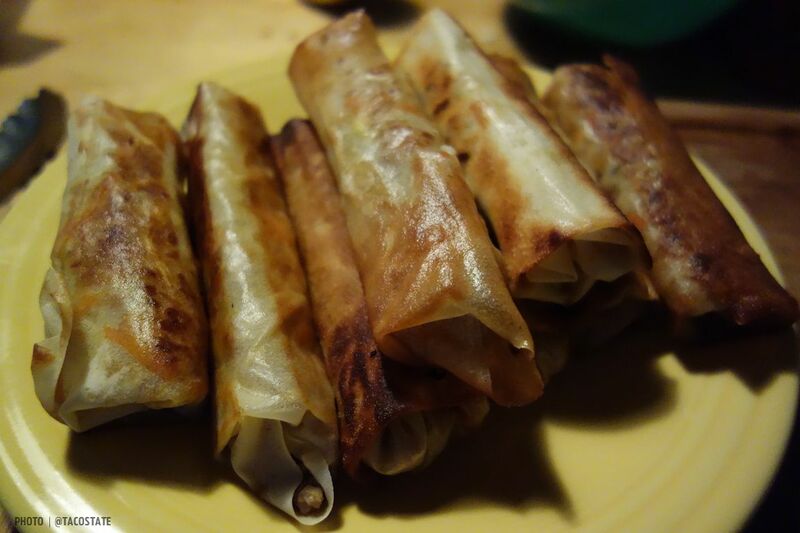 Now for years and years I had this idea about lumpia that I couldn't make them. 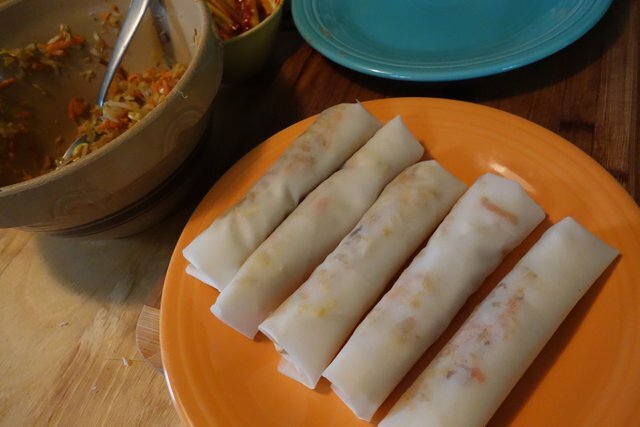 It was ingrained in my head that this classic Phillipine eggroll was time consuming, difficult and only for special occasions. Nobody ever actually told me this, but that's the conclusion I came to based on my experience with it. I grew up eating these, but noted early on that my Mom would only make them on special occasions or holidays, giving me the impression that they were too hard to make, otherwise we'd have them much more often. I also remember the amount of time it took to make them, she was in the kitchen for what seemed like a long time, rolling out these little eggrolls and then frying each one. It seemed to take forever. It didn't really occur to me that she made these on special occassions because everyone loved them, nor did it occur to me that they took so long to make because on big holidays there were lots of people to feed and that meant lots and lots of lumpia because you can't eat just 2 or 3, you kind of want 6 or 7 each. 😂 I made these little associations and simply deemed making them somehow inappropriate to do for 1 or 2 people. Strange how the mind works. 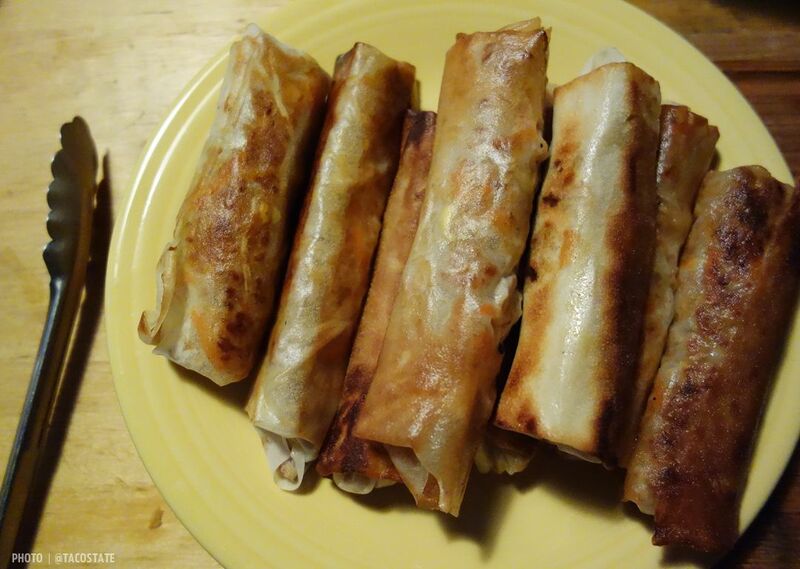 I got over telling myself I couldn't and last summer I watched my Mom make a batch of lumpia and realized just how easy it all was, so a couple of weeks ago, I finally rolled up my sleeves and made a batch myself and like the kid riding his bike for the first time, I was ecstatic that I could. First you have to find the right wrappers. Since this was my first time making lumpia, I made sure that the package said 'lumpia' on it. They are thin, easy to separate pastry sheets and this pack had 25 sheets. I felt greedy seeing '25' because my first thought was that I wanted more than 25, but I figured I'd start small. 😂 The typical lumpia has ground pork or very small cut pork that's sauteéd with garlic and onion. 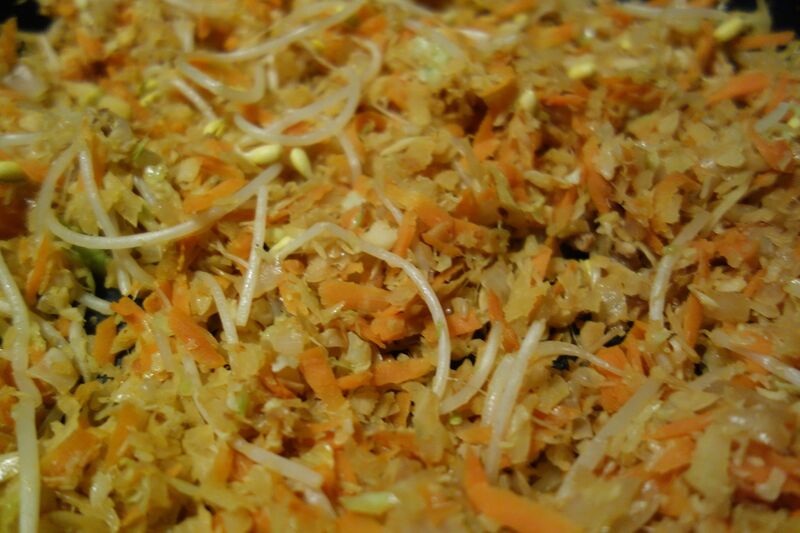 I made a batch of vegetarian which consisted of grated cabbage and carrots. This was mixed in a large bowl with garlic and onion and finally soy beans which add a nice bit of crunch. My Mom also uses chopped waterchestnuts for added crunch, but I don't enjoy that texture, but if you want extra crunch, go for it. In the photo below, you can see the proportion of what I put into my mixture and the amount of soy beans I used. I think next time, I will put in more onion and more garlic, but no complaints. Once you've got your mixture all assembled, it's just a matter of putting some into the wrapper and rolling them up. I did learn that over-filling them is not necessarily the best approach and smaller ones result in crispier rolls and are less likely to break or crack open. Heat a pan with a good amount of oil, when very hot, add 3 or 4 rolls without crowding too much. They will cook fast, so be attentive and move them around using tongs to brown and crisp all sides. When browned, removed to a paper towel lined plate to absorb excess oil. Use your favorite dipping sauce, hot mustard, or sweet and sour sauce and go to town! After I made this first successful batch of lumpia, I was overjoyed. I didn't need to fly 3,000 miles to a special family gathering to have these. I didn't have to wait for the holidays, I could literally make a few and have them for lunch which is exactly what I did when I fried up my second batch two days later. So remember, thoughts are vibration and changing our thoughts creates new vibration and when we think we are great, we ARE great. I just happen to be the BEST lumpia maker on the East Coast of the United States. 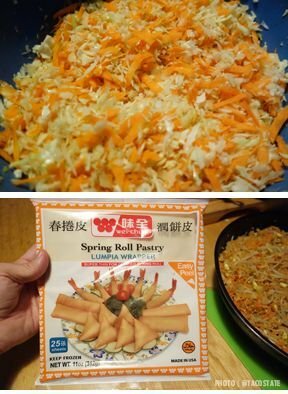 I use the similar spring roll sheets.You are right the smaller the better as it is way more crunchy and do not easily pierce.I used the same sheets for samosa recipe with tuna posted it a while ago.